Isaiah King-Cruz/Contributing Photographer Two student-directed one-act plays will be performed from Thursday, April 11 to Sunday, April 14 in Studio A and Studio B in the Fine Arts Building. “Seascape with Sharks and Dancer,” written by playwright Don Nigro, is a romantic drama with comedic elements. It tells the story of two imperfect strangers, Ben and Tracy, who meet when Ben rescues Tracy from drowning in the ocean and brings her back to safety in his seaside home. Over the course of the night and morning that follow, their rival personalities come to literal and metaphorical blows, but their abrasive chemistry leads to a connection that helps two lonely people feel a little less alone. Samantha Goss, a junior majoring in theatre, is the director of this production. She said part of her motivation for picking the script came from a desire to push her boundaries as a director and prepare herself for future projects. Discussing the difficulties of the production, Goss stated that the rushed timeline for rehearsal was an added challenge to an already difficult show. 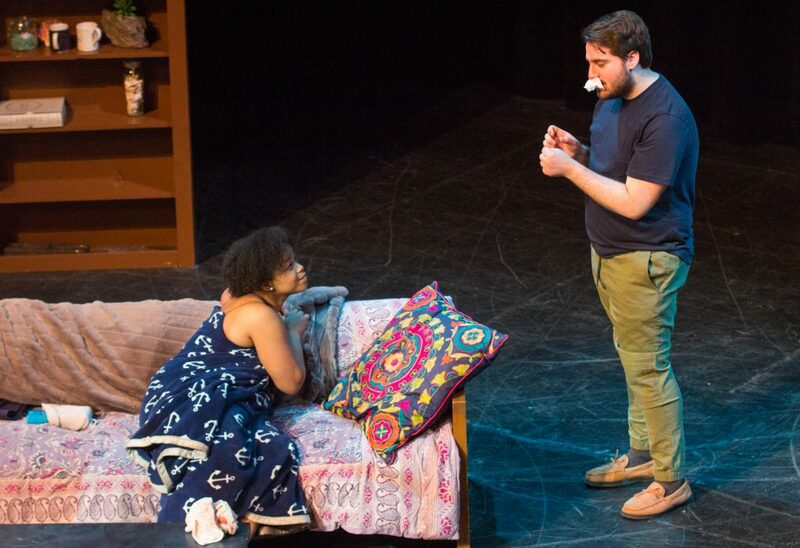 Brianna Simpkins, a senior majoring in political science who plays Tracy, emphasized the realism of the play and praised its characters for their authenticity. “See it because it’s real,” Simpkins added. The second play, “You Belong To Me,” is a surrealist dark comedy with all emphasis on the dark. Written by playwright Keith Reddin, it portrays inexplicable violent thoughts that work their way into a person’s psyche, with each scene other than the final one featuring the same three characters in imagined murders. Characters take turns being the victim and the killer or killers as the play contemplates a variety of ways that an ostensibly happy marriage and friendship could take the darkest turn possible. The play is directed by Jenna Brady, a senior double-majoring in cinema and theatre. She said that while trying to choose the one-act play she would direct, she came across the script at the last hour and fell for its unconventional nature. Gabriel Pinciotti, a junior majoring in theatre who plays the character of Larry, said he thinks that the rehearsal process has helped the cast and crew become more collective in their vision of the production. “We all went from having preconceived notions of what the show should be and then all coming together on one joint idea that everybody agrees with,” Pinciotti said. Brady echoed this sentiment and stressed the role that a cooperative atmosphere played in helping her vision come to life. “In The Works” will run at 8 p.m. from Thursday, April 11 to Sunday, April 14 in Studio A Theater for “You Belong To Me” (FA 192) and Studio B Theater for “Seascape with Sharks and Dancer” (FA 196). It will cost $4 at the door to see both shows.